Ages ago, giants and dragons waged war across the Savage Frontier. These battles are long forgotten by the human civilisations of today, but ancient relics remain. And now, the land shudders once more with the thunder of giant footsteps. Hill giants raid farms for food and livestock, as stone giants lay waste to settlements in their path. Frost giants plunder coastal towns, as fire giants gather slaves. Cloud giant castles drift across the sky, casting ominous shadows on the cities of the North. But no threat compares to the wrath of the storm giants, who stand betrayed. 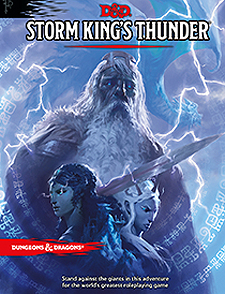 Puny adventurers must rise to the challenge, gather their strength, unlock the power of ancient runes, and take the fight to the giants' doorsteps. Only then can they discover a hidden evil fomenting a war between giants and small folk. Only then can they forge an alliance to end the war before it begins.